Image of green salad provided via Creative Commons license by timlewisnm at Flicker. The days are cooler, so I’m thinking “turkey.” I bet you are too. Before we know it, Thanksgiving and then it’s already New Year’s Day. Lots of gatherings around the groaning board with family, friends, neighbors and co-workers. Did you know the average adult gains seven pounds during the holidays? I’m not good at following that kind of advice because I love food. Since digestion consumes over 40% of the body’s blood supply and requires more effort and energy than any other bodily process, eating more leaves all of us with an energy deficit at a time when extra energy and oomph is most needed. To make matters worse, most hosts don’t cook simply, especially around the holidays. We’ll all be eating too many ingredients that are hard on the digestive system. (Think “foods” like Cool Whip, marshmallows, candied oranges and creamed spinach with canned crispy fried onions on top.) Of course there are too many highly-caloric foods we all love like cheese and chocolate too. Think variety, simplicity and color. For example, roasted potatoes, yams and parsnips instead of candied yams. Crisp, steamed green beans instead of green beans drenched in butter and gloopey canned mushroom soup. Try Pink Lady apples baked with maple syrup and cinnamon and served with fresh berries instead of a more caloric dessert. Maybe a succulent pear with a drizzle of chocolate? Welcome company with a platter of veggies like pea pods, thinly sliced jicama ? unusual veggies, whatever takes your fancy – together with marinated artichoke hearts and oil-cured black olives. Serve the easiest salad known to man, mixed baby greens dressed with garlicky olive oil vinaigrette. Garnish with pumpkinseeds in honor of the season. Why green salad? 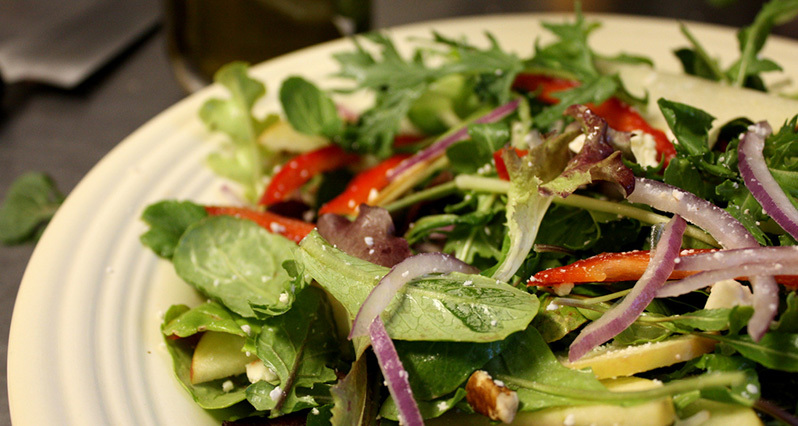 Not only does a green salad cleanse the palette, it provides enzymes. It freshens breath. They say, too, that salad fills us up but not out. Well, I find that to be truer with a whole grain quinoa-lentil pilaf, which is a part of my holiday meal. But let’s do the salad just the same. We can’t control the menu when we’re at someone else’s house, but we can change some patterns in our own homes, and we can protect ourselves and make things easier for our bodies when we’re home and before we head out too. Try starting the morning off with 1 tablespoon raw apple cider vinegar and 1 tablespoon liquid chlorophyll in a mug full of warm water. I do this most mornings and have for years. (Don’t like the green stuff? Try, at the very least, the raw apple cider vinegar in water.) The combination provides old-fashioned enzymes and blood cleansing. Liquid chlorophyll acts as an internal deodorizer too. When not partying, my rule of thumb is to simplify and eat a few ingredients at any given meal. A bowl of brown rice with steamed or sautéed veggies is easy on the tummy. Amazing how good “simple” can taste too. A daily favorite recipe to help the liver is one cup of finely shredded carrots or chopped kale with one tablespoon olive oil and 1 tablespoon fresh lemon or lime juice. Adding more dressing is fine, but not less. Adding garlic, avocado and black pepper is optional. Supplements? Don’t forget the digestive enzymes. Help the liver with milk thistle. Stabilize blood sugar with alpha lipoic acid. A fiber supplement called “glucomanan” 20-30 minutes before a meal will help fill you up without causing gas. Natural Factors makes a glucomanan supplement called “WellBetX with Mulberry,” said by the company to “diminish after-meal spikes in glucose and insulin by blocking enzymes that break down starches and sugars in the body.” Good luck everyone!